The Wind Rises (Japanese: 風立ちぬ, Hepburn: Kaze Tachinu) is a 2013 Japanese animated historical drama film written and directed by Hayao Miyazaki, animated by Studio Ghibli for the Nippon Television Network, Dentsu, Hakuhodo DY Media Partners, Walt Disney Japan, Mitsubishi, Toho and KDDI and distributed by Toho. It was released on 20 July 2013, in Japan, and was released in North America on 21 February 2014 under Disney's adult movie brand Touchstone Pictures. The Wind Rises is a fictionalized biopic of Jiro Horikoshi (1903–1982), designer of the Mitsubishi A5M fighter aircraft and its successor, the Mitsubishi A6M Zero, used by the Empire of Japan during World War II. The film is adapted from Miyazaki's manga of the same name, which was in turn loosely based on both the 1937 novel The Wind Has Risen by Tatsuo Hori and the life of Jiro Horikoshi. It was the final film directed by Miyazaki before his retirement in September 2013. However, in 2017, Miyazaki announced he had come out of retirement to direct How Do You Live?, which is expected to be released in 2020 or 2021. The Wind Rises was the highest-grossing Japanese film in Japan in 2013. It won and was nominated for several awards, including nominations for the Academy Award for Best Animated Feature, the Golden Globe Award for Best Foreign Language Film, and the Japan Academy Prize for Animation of the Year. In 1918, a young Jiro Horikoshi longs to become a pilot, but his nearsightedness prevents it. He reads about the famous Italian aircraft designer Giovanni Battista Caproni, and dreams about him that night. In the dream, Caproni tells him that he has never flown a plane in his life, and that building planes is better than flying them. Five years later, Jiro is traveling by train to study aeronautical engineering at Tokyo Imperial University and meets a young girl, Naoko Satomi, traveling with her maid. When the Great Kanto Earthquake of 1923 hits, Naoko's maid's leg is broken and Jiro carries her to Naoko's family, leaving without giving his name. In 1927, Jiro graduates with his friend Kiro Honjo and both are employed at aircraft manufacturer Mitsubishi and are assigned to design a fighter plane, the Falcon, for the Imperial Army. During tests, the Falcon breaks apart in mid-air and the Army rejects it. Dispirited about the seeming backwardness of Japanese technology, Jiro and Honjo are sent to Germany in 1929 to carry out technical research and obtain a production license for a Junkers G.38 aircraft. Jiro sees Hugo Junkers, argues with German guards and witnesses violent antisemitism. He dreams again of Caproni, who tells him that the world is better for the beauty of planes, even if humankind might put them to terrible purposes. In the spring of 1932, Jiro is promoted to chief designer for a fighter plane competition sponsored by the Imperial Navy, but his design, the Mitsubishi 1MF10, fails testing in 1933 and is rejected. Disappointed, Jiro goes to a summer resort in Karuizawa to rest, where he meets Naoko again. They become engaged, but Naoko has tuberculosis and refuses to marry until she recovers. Castorp, a German visitor privately critical of the Nazi regime, assists in the romance before fleeing arrest by the Japanese secret police. Wanted in connection with Castorp, Jiro hides at his supervisor's home while he works on a new navy project. Following a lung hemorrhage, Naoko recuperates in a mountain sanatorium but cannot bear being apart from Jiro, and returns to marry him. Jiro's sister Kayo, now a doctor, warns Jiro that his marriage to Naoko will end badly as tuberculosis is incurable. Though Naoko's health deteriorates, she and Jiro enjoy their time together. Jiro leaves for the test flight of his new prototype aircraft, the Mitsubishi A5M. Knowing that she will die soon, Naoko returns to the sanatorium, leaving letters for Jiro, her family, and friends. At the test site, Jiro is distracted from his success by a gust of wind, suggesting Naoko's death. In the summer of 1945, Japan has lost World War II and has been devastated by air raids. Jiro again dreams of meeting Caproni, telling him he regrets his aircraft was used for war. A group of Zeros fly past and their pilots salute Jiro. Caproni comforts him, saying Jiro's dream of building beautiful aircraft was nonetheless realized. Naoko appears, exhorting her husband to live his life to the fullest. "Le vent se lève!... Il faut tenter de vivre! ("The wind rises!... We must try to live!")" — Paul Valéry, "Le Cimetière Marin" (The Graveyard by the Sea). The Wind Rises was directed by Hayao Miyazaki, whose previous films include My Neighbor Totoro, Princess Mononoke, and Spirited Away. It was the first film that Miyazaki solely directed since Ponyo in 2008. Miyazaki began to conceive a story to illustrate the life of Jiro Horikoshi in 2008. He published the story as a manga series in the monthly magazine Model Graphix from April 2009 to January 2010, with the title borrowed from Tatsuo Hori's novel The Wind Has Risen (風立ちぬ?). The story in the manga follows the historical account of Horikoshi's aircraft development up to 1935 (the year of the Mitsubishi A5M maiden flight), and intertwines with fictional encounters with Caproni and Nahoko Satomi (里見菜穂子?). The scenes with Nahoko in the manga were adopted from the novel The Wind Has Risen, in which Tatsuo Hori wrote about his life experience with his fiancée, Ayako Yano (矢野綾子? ), before she died from tuberculosis. The name Nahoko Satomi was borrowed from the female protagonist of another novel by Tatsuo Hori, Nahoko (菜穂子?). Characters frequently discuss Thomas Mann's novel The Magic Mountain, and, in a letter to Nahoko, Jiro names his fleeing German friend "Mr. Castorp" after its protagonist. The character himself is a caricature of former Ghibli employee Stephen Alpert who returned to Japan to voice the character. After the release of Ponyo, Miyazaki wanted his next film to be a sequel, Ponyo on the Cliff by the Sea II, but producer Toshio Suzuki proposed to adopt the manga The Wind Has Risen instead. At first, Miyazaki rejected the proposal because he created the manga as a hobby and considered its subjects not suitable for children, the traditional audience of the feature animations from Studio Ghibli. However, Miyazaki changed his objection after a staff member suggested that "children should be allowed to be exposed to subjects they are not familiar with". Miyazaki was inspired to make the film after reading a quote from Horikoshi: "All I wanted to do was to make something beautiful". The film's score was composed and conducted by Joe Hisaishi, and performed by the Yomiuri Nippon Symphony Orchestra. The film also includes singer-songwriter Yumi Matsutoya's 1973 song "Hikōki-gumo" (ひこうき雲). Matsutoya has collaborated with Studio Ghibli before in the production for Kiki's Delivery Service, which features her songs Rouge no Dengon (ルージュの伝言) and Yasashisa ni Tsutsumaretanara (やさしさに包まれたなら). 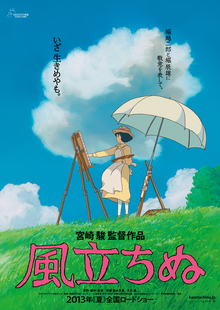 Producer Suzuki recommended "Hikōki-gumo" to Miyazaki in December 2012, feeling the lyrics resembled the story of The Wind Rises. The Wind Rises soundtrack was released in Japan on 17 July 2013, by Tokuma Japan Communications. Das gibt's nur einmal (English: It only happens once) is the German song Hans Castorp sings while playing the piano at Hotel Kusakaru in the film. Jiro Horikoshi and Nahoko's father later join the singing. This song is composed by Werner Richard Heymann for the German movie Der Kongreß tanzt. The Wind Rises was to have been released simultaneously with The Tale of the Princess Kaguya, another Ghibli film by Isao Takahata, in Japan in mid-2013. This would have been the first time that the works of the two directors were released together since the release of the films My Neighbor Totoro and Grave of the Fireflies in 1988. However, Princess Kaguya was delayed until 23 November 2013, and The Wind Rises was released on 20 July 2013. The film played in competition at the 70th Venice International Film Festival. It had its official North American premiere at the 2013 Toronto International Film Festival, although a sneak preview of the film was presented earlier at the 2013 Telluride Film Festival (the film screened outside the official program). Walt Disney Studios Motion Pictures distributed the film in North America through its adult film label Touchstone Pictures. The film's English dubbing was directed by Gary Rydstrom. Disney held a one-week release window in the Los Angeles theatrical circuit for the film beginning on 8 November 2013, so that it could qualify for Academy Awards consideration. The film was released theatrically on 21 February 2014, in select cities, with wide release on 28 February. The film was released in the United Kingdom on 9 May 2014, with distribution by StudioCanal. Touchstone Home Entertainment released The Wind Rises on Blu-ray Disc and DVD on 18 November 2014. The Wind Rises release includes supplement features with storyboards, the original Japanese trailers and TV spots, a "Behind the Microphone" featurette with members of the English voice cast and a video from when the film was announced to be completed. The audio format for both English and Japanese language are in mono (DTS-HD MA 1.0). Even though Disney's North American rights to Studio Ghibli films they owned expired in 2017, Touchstone will continue to distribute The Wind Rises for the near future as GKIDS confirmed they wouldn't re-release the movie due to it still being a fairly new movie. GKIDS however currently own the theatrical rights to it. The film grossed ¥11.6 billion (US$113 million) at the Japanese box office, becoming the highest-grossing film in Japan in 2013. The Wind Rises received critical acclaim. Rotten Tomatoes sampled 168 reviews and judged 89% of them to be positive, giving the film a "Certified Fresh" rating, with an average score of 7.9/10. The consensus states: "The Wind Rises is a fittingly bittersweet swan song for director Hayao Miyazaki". Metacritic, which assigns a weighted average score, rated the film an 83/100 based on 41 reviews, citing "universal acclaim". Film critic David Ehrlich rated the film 9.7/10 and called it, "Perhaps the greatest animated film ever made." Ehrlich further writes, "While initially jarring, Miyazaki's unapologetic deviations from fact help The Wind Rises to transcend the linearity of its expected structure, the film eventually revealing itself to be less of a biopic than it is a devastatingly honest lament for the corruption of beauty, and how invariably pathetic the human response to that loss must be. Miyazaki’s films are often preoccupied with absence, the value of things left behind and how the ghosts of beautiful things are traced onto our memories like the shadows of objects outlined by a nuclear flash. The Wind Rises looks back as only a culminating work can." The Japan Times gave the film a 3 ​1⁄2 stars out of 5, and states "A visually sumptuous celebration of an unspoiled prewar Japan." In a review for The Asia-Pacific Journal, Matthew Penney wrote "What Miyazaki offers is a layered look at how Horikoshi's passion for flight was captured by capital and militarism", and "(the film) is one of Miyazaki's most ambitious and thought-provoking visions as well as one of his most beautifully realized visual projects". In Japan, The Wind Rises received criticism from both the political right and from the Japan Society for Tobacco Control. Miyazaki added to the controversy by publishing an article in which he criticized the proposal by Japan's centre-right Liberal Democratic Party to change the Constitution of Japan, which irritated nationalists. Some commentators were unhappy that a warplane engineer was the film's protagonist. In an interview with the Asahi Shimbun, Miyazaki said he had "very complex feelings" about World War II since, as a pacifist, he felt militarist Japan had acted out of "foolish arrogance". However, Miyazaki also said that the Zero plane "represented one of the few things we Japanese could be proud of – [Zeros] were a truly formidable presence, and so were the pilots who flew them". The Wind Rises received thirteen nominations and seventeen awards for "Best Animated Feature" including one Academy Award nomination. Hayao Miyazaki won the award for "Writing in an Animated Feature Production" at 41st Annie Awards. Film's musical composer, Joe Hisaishi was awarded with Japan Academy Prize in the category of Best Music Score. It was also selected as "Audience Favorite – Animation" at Mill Valley Film Festival. The Kingdom of Dreams and Madness, a 2013 documentary about the making of the film. Porco Rosso, a 1992 Ghibli animated film which contains a number of similar thematic elements. The Cockpit, a similar 1993 anime OVA focusing on World War II Axis allegiances, also featuring an emphasis on the warplanes. Grave of the Fireflies, another Ghibli anime film from 1988 covering the Japanese perspective on World War II and its effects on civilians. ^ "THE WIND RISES (12A)". StudioCanal. British Board of Film Classification. 31 March 2014. Archived from the original on 7 April 2014. Retrieved 1 April 2014. ^ Robles, Manuel (2013). Antología Studio Ghibli: Volumen 2. Barcelona: Dolmen Editorial. p. 80. ISBN 978-8415296935. ^ "The Wind Rises (2014) - Box Office Mojo". Archived from the original on 4 April 2014. ^ "International Total Gross". Box Office Mojo. Archived from the original on 28 February 2014. Retrieved 3 March 2014. ^ a b Cunningham, Todd (27 August 2013). "Disney Will Release Hayao Miyazaki's 'The Wind Rises' in U.S." The Wrap. Archived from the original on 27 August 2013. Retrieved 27 August 2013. ^ Movie Trailers, New Movies, Upcoming Movies, Movies, 2014 Movies, Films, DVD, Blu-ray, TV, Videos, Video, Game, Clips Archived 22 January 2014 at the Wayback Machine. ComingSoon.net. Retrieved on 2014-05-12. ^ Russ Fischer (21 November 2012). "Studio Ghibli Titles New Films From Hayao Miyazaki and Isao Takahata; 'Grave of the Fireflies' Picked Up For US Re-Release". slashfilm.com. Archived from the original on 18 January 2013. Retrieved 24 November 2012. ^ Akagawa, Roy (6 September 2013). "Excerpts of Hayao Miyazaki's news conference announcing his retirement". Asahi Shimbun. Archived from the original on 7 September 2013. Retrieved 5 February 2014. ^ Vincent, James (24 February 2017). "Hayao Miyazaki is out of retirement and working on a new film, says Studio Ghibli producer". The Verge. Archived from the original on 27 February 2018. Retrieved 26 February 2018. ^ "Ghibli's Hayao Miyazaki Reveals His 'Final' Film's Title, Release Window". Anime News Network. 28 October 2017. Archived from the original on 24 February 2018. Retrieved 26 February 2018. ^ Chitwood, Adam. "English-Language Voice Cast for Hayao Miyazaki's THE WIND RISES Includes Joseph Gordon-Levitt, Emily Blunt, and Mandy Patinkin". Collider. Archived from the original on 30 August 2014. ^ "Newspaper: Evangelion's Hideaki Anno to Star in Ghibli's Kaze Tachinu Film". Anime News Network. Archived from the original on 19 April 2014. ^ Truitt, Brian (16 December 2013). "Gordon-Levitt, Blunt head up 'The Wind Rises' U.S. cast". USA Today. Archived from the original on 21 December 2013. Retrieved 17 December 2013. ^ Shone, Tom (February 21, 2014). "The Wind Rises: a flight into Hayao Miyazaki's magic and poetry Archived 2 February 2017 at the Wayback Machine". The Guardian (London). Retrieved 9 December 2014. ^ "Le Cimetière marin" Archived 5 March 2014 at the Wayback Machine. ^ "ジブリ新作、2作一挙公開！宮崎駿＆高畑勲作品でジブリ史上初！". Cinema Today. 13 December 2012. Archived from the original on 16 December 2012. Retrieved 27 December 2012. ^ a b c "Ghibli Announces Miyazaki's Kaze Tachinu, Takahata's Kaguya-hime no Monogatari". Anime News Network. 13 December 2012. Archived from the original on 3 January 2013. Retrieved 27 December 2012. ^ a b 劉黎兒. 人物專訪／風起了 聽宮崎駿內心的聲音. tw.news.yahoo.com (in Chinese). Yahoo Taiwan. Archived from the original on 6 October 2014. Retrieved 2 October 2014. ^ The Wind Rises Visual Guide (in Japanese). Kadokawa Shoten. 20 July 2011. p. 88. ISBN 978-4-04-110510-8. ^ The Wind Rises Visual Guide (in Japanese). Kadokawa Shoten. 20 July 2011. p. 77. ISBN 978-4-04-110510-8. ^ The Wind Rises Visual Guide (in Japanese). Kadokawa Shoten. 20 July 2011. p. 92. ISBN 978-4-04-110510-8. ^ The Wind Rises Visual Guide (in Japanese). Kadokawa Shoten. 20 July 2011. p. 93. ISBN 978-4-04-110510-8. ^ The Wind Rises Visual Guide (in Japanese). Kadokawa Shoten. 20 July 2011. p. 60. ISBN 978-4-04-110510-8. ^ Sachs, Ben (19 February 2014). "The Wind Rises: On a higher plane". Chicago Reader. Archived from the original on 20 September 2015. Retrieved 12 August 2015. ^ "The Wind Rises Production Notes". www.scifijapan.com. Archived from the original on 3 March 2016. Retrieved 23 January 2016. ^ 宮崎駿專訪：時代追上了我. nikkei.com (in Chinese). 日經中文網. Archived from the original on 6 October 2014. Retrieved 2 October 2014. ^ a b c d Keegan, Rebecca (15 August 2013). "'The Wind Rises': Hayao Miyazaki's new film stirs controversy". Los Angeles Times. Archived from the original on 17 August 2013. Retrieved 16 August 2013. ^ The Wind Rises Visual Guide. Kadokawa Shoten. 20 July 2011. p. 39. ISBN 978-4-04-110510-8. ^ "Music, Theme Song". The Wind Rises Official Web Site (in Japanese). Archived from the original on 30 August 2014. Retrieved 18 September 2014. ^ 久石譲 (2013). 風立ちぬ サウンドトラック (CD) (in Japanese). Tokuma Japan Communications. ^ "Isao Takahata's Kaguya-hime Film Delayed to This Fall". Anime News Network. 5 February 2013. Archived from the original on 12 March 2013. Retrieved 25 March 2013. ^ "Venezia 70". labiennale. Archived from the original on 26 September 2015. Retrieved 25 July 2013. ^ "Venice film festival 2013: the full line-up". The Guardian. London. 25 July 2013. Archived from the original on 28 August 2013. Retrieved 25 July 2013. ^ "The Wind Rises Festival Special Presentation". August 2013. Archived from the original on 18 August 2013. ^ Telluride Film Festival Archived 5 September 2017 at the Wayback Machine. Telluride Film Festival (2013-07-15). Retrieved on 2014-05-12. ^ Hill, Jim (26 February 2014). "Joseph Gordon-Levitt Loves How Hayao Miyazki's The Wind Rises Celebrates the Magic of Normal, Everyday Life". The Huffington Post. Archived from the original on 3 March 2014. Retrieved 27 February 2014. ^ Lumenick, Lou (7 November 2013). "'The Wind Rises' another stunning animated masterpiece". The New York Post. Archived from the original on 22 November 2013. Retrieved 18 November 2013. ^ Keegan, Rebecca (11 September 2013). "Miyazaki's 'The Wind Rises' to get Oscar-qualifying run in November". The Los Angeles Times. Archived from the original on 13 September 2013. Retrieved 12 September 2013. ^ Williams, Mike (7 February 2014). "The Wind Rises confirms UK release date". Yahoo!. Archived from the original on 5 March 2014. Retrieved 27 February 2014. ^ "Details for Studio Ghibli's "Princess Mononoke", "Kiki's Delivery Service", "The Wind Rises" on Disney Blu-ray". www.toonzone.net. Archived from the original on 12 October 2014. Retrieved 26 September 2014. ^ Box Office Mojo. "October 26–27, 2013 Japan Box Office". Box Office Mojo. Archived from the original on 1 February 2014. Retrieved 30 January 2014. ^ Kevin Ma (1 January 2014). "The Wind Rises tops 2013 Japan B.O." Film Business Asia. Archived from the original on 2 January 2014. Retrieved 5 January 2014. ^ "The Wind Rises". Rotten Tomatoes. Archived from the original on 20 July 2014. Retrieved 24 July 2014. ^ "The Wind Rises". Metacritic. Archived from the original on 21 July 2014. Retrieved 24 July 2014. ^ Review: ‘The Wind Rises’ Archived 21 November 2014 at the Wayback Machine. Film.com. Retrieved on 2014-05-12. ^ Film/Reviews. "Kaze Tachinu (The Wind Rises)" Archived 11 August 2014 at the Wayback Machine. The Japan Times. ^ Penney, Matthew (5 August 2013). "Miyazaki Hayao's Kaze Tachinu (The Wind Rises)". The Asia-Pacific Journal. 11 (30, No. 2). Archived from the original on 9 August 2013. Retrieved 9 August 2013. ^ a b c d McCurry, Justin (23 August 2013). "Japanese animator under fire for film tribute to warplane designer". The Guardian. Archived from the original on 13 April 2017. Retrieved 25 August 2013. ^ a b Staff (16 January 2014). "2013 Academy Awards Nominations and Winners by Category". Box Office Mojo. Archived from the original on 28 February 2014. Retrieved 16 January 2014. ^ a b "Hayao Miyazaki Wins Annie Award for Writing The Wind Rises". Anime News Network. 2 February 2014. Archived from the original on 2 February 2014. Retrieved 2 February 2014. ^ a b Loo, Egan. "The Wind Rises, Madoka, Lupin vs. Conan, Harlock, Kaguya Earn Japan Academy Prize Nods". Anime News Network. Christopher Macdonald. Archived from the original on 30 January 2014. Retrieved 30 January 2014. ^ "Mill Valley Film Festival 36 Audience Favorites Awards". Mill Valley Film Festival. California Film Institute. Retrieved 17 January 2019. ^ "2013 EDA Award Nominess". Alliance of Women Film Journalists. 11 December 2013. Archived from the original on 16 December 2013. Retrieved 11 December 2013. ^ Jagernauth, Kevin (2 December 2013). "'Frozen' & 'Monsters University' Dominate Annie Awards Nominations With 10 Each". Indiewire. Archived from the original on 3 December 2013. Retrieved 2 December 2013. ^ Derks, David (2 December 2013). "41st #AnnieAwards Nominations Announced". ASIFA-Hollywood. Archived from the original on 5 December 2013. Retrieved 2 December 2013. ^ "American Hustle, 12 Years A Slave Lead BFCA's Critics Choice Movie Awards Nominations". Deadline Hollywood. 17 December 2013. Archived from the original on 23 September 2014. Retrieved 17 December 2013. ^ "Denver Film Critics Society Nominations". Awards Daily. 6 December 2013. Archived from the original on 7 January 2014. Retrieved 6 January 2014. ^ Adams, Ryan (13 January 2014). "Denver Film Critics Society Award Winners". Awards Daily. Archived from the original on 16 January 2014. Retrieved 13 January 2014. ^ "2013 Georgia Film Critics Association Nominations". HitFix. 6 December 2013. Archived from the original on 23 January 2014. Retrieved 6 January 2013. ^ Davis, Clayton. "2014 Golden Globe Nominations Announcement". AwardsCircuit.com. Archived from the original on 12 December 2013. Retrieved 12 December 2013. ^ Lee, Kim. "Miyazaki "The Wind Rises" Nominated For "Best Foreign Language Film" Golden Globe". 247AsianMedia.com. Archived from the original on 12 December 2013. Retrieved 12 December 2013. ^ Stone, Sasha (15 December 2013). "12 Years a Slave wins Pic, Cuaron Director for Houston Film Critics". Awards Daily. Archived from the original on 23 December 2013. Retrieved 15 December 2013. ^ "IGN: Best Animated Movie". IGN. Archived from the original on 21 December 2013. Retrieved 9 January 2013. ^ "Indiana Film Journalists Association Award Winners". The Hollywood News. 19 December 2013. Archived from the original on 20 December 2013. Retrieved 19 December 2013. ^ Joey Magidson (13 January 2014). "International cinephile society nominations". Awardscircuit. Archived from the original on 27 February 2014. Retrieved 23 February 2014. ^ Adams, Ryan (10 January 2013). "12 Years a Slave wows Iowa Critics". Awards Daily. Archived from the original on 10 January 2014. Retrieved 10 January 2013. ^ Seto, Shintaro. "日本アカデミー賞にスタジオジブリ2作品、ハーロック、まどかマギカ、ルパンvsコナンの5本". AnimeAnime.jp. Archived from the original on 19 January 2014. Retrieved 30 January 2014. ^ Stone, Sasha (13 December 2013). "San Francisco Film Critics Nominations". Awards Daily. Archived from the original on 15 December 2013. Retrieved 13 December 2013. ^ Tapley, Kristopher (16 December 2013). "2013 Southeastern Film Critics Association winners". HitFix. Archived from the original on 29 August 2014. Retrieved 16 December 2013. ^ Lacey, Liam (17 December 2013). "Toronto film critics name Coen brothers movie the best of 2013". The Globe and Mail. Archived from the original on 2 July 2015. Retrieved 17 December 2013. ^ Szklarski, Cassandra (17 December 2013). "Toronto critics pick Inside Llewyn Davis". Metron News. Archived from the original on 12 July 2014. Retrieved 17 December 2013. ^ Adams, Ryan (20 December 2013). "Utah Film Critics". Awards Daily. Retrieved 20 December 2013. This page was last edited on 19 April 2019, at 19:04 (UTC).